The Zimbra user interface is a browser-based utility that allows you to manage not only your email but the many collaborative tools available for your use. To login to the Zimbra webmail interface, go to https://zimbra.xmission.com and login with your full email address and password. 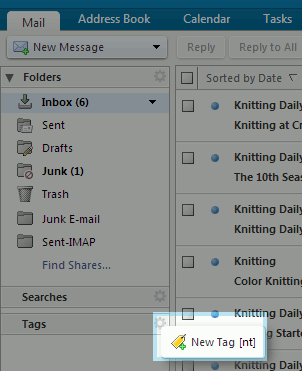 The application tabs near the top of your screen indicate what areas of Zimbra you will be working with. Please note that only customers who have purchased Premium Hosted Email will see and be able to utilize all the application tabs. If you find that one of these application tabs is missing and would like to have it available, consider upgrading to a higher level of service! For more information, please contact our sales team. Mail: Compose, delete, and manage your email. Contacts: Create, remove, share, and manage contacts for your email. Preferences: Manage your user preferences. Changing your password through the Zimbra webmail interface is easy and we will show you how below. First, take a few seconds to read about password best practices. XMission recommends using secure passphrases consisting of multiple words and special characters since they can be much easier to remember. Ideally it is best to use longer, more complex pass phrases to properly protect yourself, and your company, from hackers. Our Zimbra system supports passwords up to 64 characters. We request a minimum password length of 12-15 characters. You can never re-use your current password. Please allow 15 minutes for your new password to propagate through the system. Write your password down in a secure location until you memorize it then destroy the note. Ensure General is selected in the left-hand column. Complete the fields in the pop-up window and click Change password to complete. Contact your Domain Administrator as they can perform password changes. 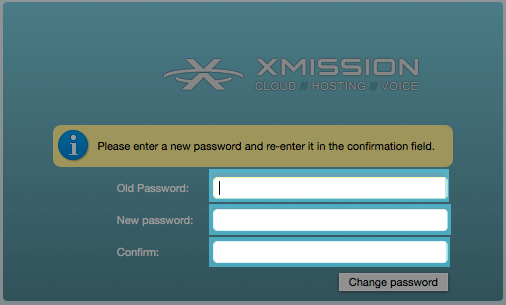 XMission will not change end user mailbox passwords. 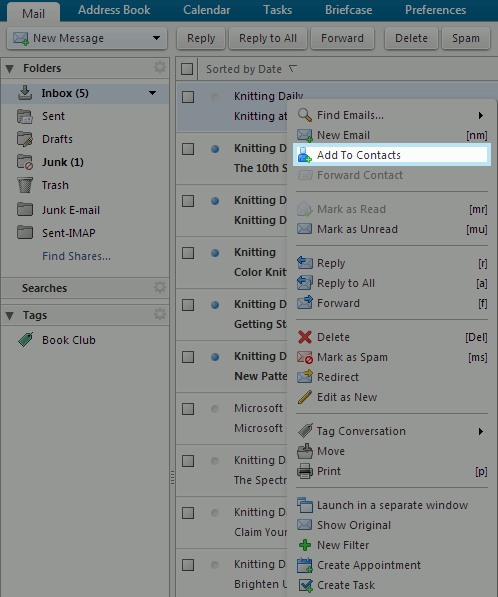 A powerful feature of the Zimbra user interface is the ability to "drag and drop" items. Not only can tags, contacts, and emails be dragged and dropped for easy organization, but you will find many features of Zimbra can be moved around via "dragging" and "dropping." For example, you can drag-and-drop emails into different folders, drag tags onto emails or contacts for easy filtering, or even drag and drop folders into other folders. To drag an item, hold down the left mouse button on the item you wish to move. Then, move the mouse while continuing to hold down the left mouse button. When you wish to drop the item, release the left-mouse button. Another powerful feature of the Zimbra user interface worth mentioning is multiple selections. You can often select multiples of items you wish to move or be tagged by simply playing a checkmark beside each item you want in your selection. Alternatively, you can even select multiple items by holding down your shift key, using your arrow keys to select anything in the list, and releasing the shift key to complete your selection. These selections can then be moved in giant "clumps," saving you time and energy and helping you to quickly organize items in exactly the way you want them. It is very easy to create and compose a new email from within the Zimbra webmail interface. From within the Mail tab you can click on the "New Message" button in the left column. There are also several handy keyboard shortcuts that can be utilized to initiate a new email. The options are; 'c' for compose new, 'C' to compose in an external browser window, 'nm' for new message, 'r' for reply, and 'a' for reply-all. 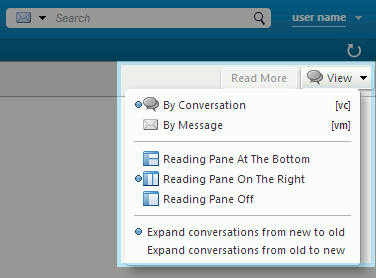 Zimbra webmail offers multiple viewing options. To access these, cllick the View pull-down menu near the upper-right corner of your window. You can choose to view By Conversation or By Message. Most prefer the conversation view as it groups email conversations together. 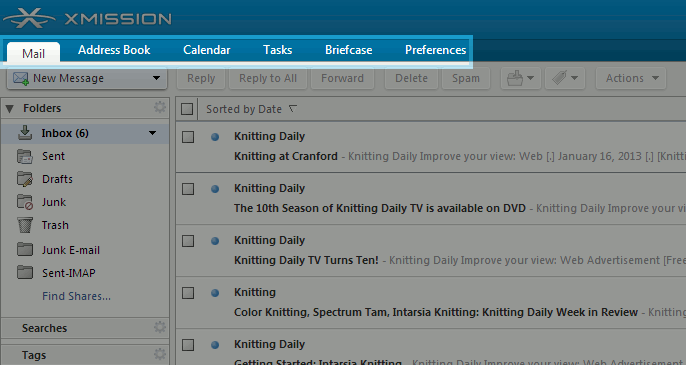 Zimbra also provides options on how email appears in the web browser. Choose from Reading Pane At The Bottom, Reading Pane On The Right, or Reading Pane Off. We suggest you try all 3 to see which option best meets your needs. TIP: Reading Pane On The Right gives the look and feel of the Outlook mail client. You can quickly search for an email or emails by typing in any text in the search field and clicking the Search icon . Be sure the pull-down menu beside the text field is set to Mail. Simple searches can be done by just entering a word into the search field. in:inbox: The operator is "in" and the parameter is "inbox" - this returns messages which are in the folder named "inbox"
Let's say you wanted to find a particular image your grandmother sent you, but you can't find the email in your inbox. To run a search that would essentially "find all messages from your grandmother that are in your inbox and have an attachment" you would run a search like this: "in:inbox from:grandma@internet.com has:attachment"
You can prefix any keyword with the word "not" to specify items that do not have that criterion -- for example not in:inbox. Search is case insensitive, meaning that "in:inbox" is the same as "in:Inbox". content: Specifies text that the message must contain. For example, content:bananas finds all items containing the word "bananas". from: Specifies a sender name or email address that is in the From header. This can be text, as in "John Smith III", an email address such as "joe@acme.com", or a domain such as "@zimbra.com". to: Same as from: except that it specifies one of the people to whom the email was addressed in the To: header. cc: Same as from: except that it specifies a recipient in the Cc: header of the message. subject: Specifies text that must appear in the subject header of the message. An example might be subject:"new vacation policy". Use quotes to search for exact match. in: Specifies a folder. For example, in:sent would show all items in your 'Sent' folder. has: Specifies an attribute that the message must have. The types of object you can specify are "attachment", "phone", or "url". For example, has:attachment would find all messages which contain one or more attachments of any type. filename: Specifies an attachment file name. For example, filename:query.txt would find messages with a file attachment named "query.txt". type: Specifies a search within attachments of a specified type. The types of attachment you can specify are "text", "word", "excel", and "pdf". For example, type:word "hello" finds messages with attachments that are Microsoft Word documents and searches within those attachments for the word "hello". attachment: Specifies any item with a certain type of attachment. For example, attachment:word would find all messages with Word attachments. date: Use this keyword to specify a date, using the format that is default for your browser's locale (for US English the format is mm/dd/yyyy). For example, date:2/1/2007 would find messages dated February 1, 2007. The greater than (>) or less than (<) symbols can be used instead of after or before. >= and <= are also allowed. after: Specifies mail sent after a certain date. For example, after:2/1/2007 specifies mail sent after February 1, 2007.
before: Same as after: except specifies mail sent before the specified date. size: Specifies messages whose total size, including attachments, is a specified number of bytes, kilobytes, or megabytes For example, size:12 kb would find messages that are exactly 12K in size. The greater than (>) or less than (<) symbols can be used instead of bigger or smaller. larger: Similar to size: except specifies greater than the specified size. smaller: Similar to size: except specifies smaller than the specified size. tag: Finds messages which have been tagged with a specified tag. 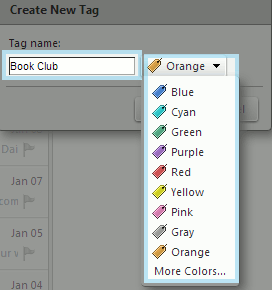 For example, tag:amber will find message that have a tag called "amber" applied. The asterisk (*) can be used as a wildcard in a search to find content that contains words that have similar spellings. Your searches can even be saved! To save a search, first run your search and then simply click Save on the search bar. You will be prompted to give your search a name. Once you've named your search, you can look up saved searches in the advanced search mode and quickly run them. For example, let's say you often need to find emails you've exchanged with your grandmother. You would type "from:grandma@internet.com" in the search field, and click Save. You could name your search "Grandma's Emails" and quickly run that search whenever you like from the Advanced Search menu! 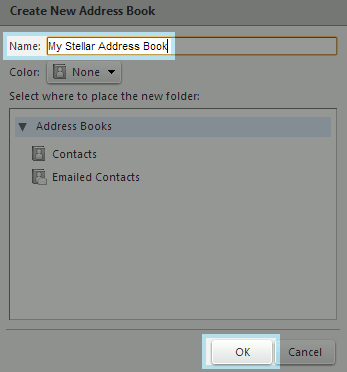 Creating new folders with the Zimbra user interface is easy. If you wish to create a a folder, simply click on the gear icon near the upper-right corner of the left-hand column and then click New Folder. Alternatively, you can right click on the folder heading or any folder and choose New Folder. You will then be prompted to name your new folder. Once named, the folder will now be displayed along with your other folders in the left-hand column. Once you have created a new folder, you may move the folder around by simply dragging and dropping it on the location you'd like it to be. If you would like to rename, delete, or share a folder, simply right-click on that folder and choose the appropriate option from the pop-up menu. There are a few ways to add a new contact to your Contacts. If you receive an email from someone you'd like to add as a contact, simply right-click on the email and choose Add to Contacts from the pop-up menu. This will automatically bring you to the contact creation screen, where you can define more information for the contact if you wish. Once you are happy with the contact info you've entered, click Save near the upper left corner of the window. You will see a box that says Contact Created. If you'd like to create a contact from scratch, click on the Contacts tab near the top of your screen and click New Contact. This will also present you with the contact creation screen. Enter all the information you would like, and then choose Save near the upper left corner of the window. You will see a box that says Contact Created. Within your Contacts, you're not limited to single contacts. You can create multiple Contact Groups to help you keep organized. For example, suppose some fellow coworkers and/or friends wanted to form a Book Club. These people are all in your Contacts, but you want to more easily find and email them. You would create a new Contact Group. To create a new Contact Group, ensure you have selected the Contacts tab and click the arrow beside New Contact to open a new menu. Then, simply click New Contact Group. Group Name: The name of your new contact group. In this example, our Contact Group would be named "Book Club." Group Members: You can search for individuals to add in the right-hand column Search field or add members immediately from your domain by selecting one ore more of them and clicking Add. Alternatively, if you wanted to add everyone in the right-hand column, you could just click Add All. You can also manually add email addresses using the box near the bottom right hand corner. Simply type the email address(es) you want to add, separate them with a comma, and click "Add." Once you have all the members you want in your new Contact Group simply click Save along the application toolbar near the top. 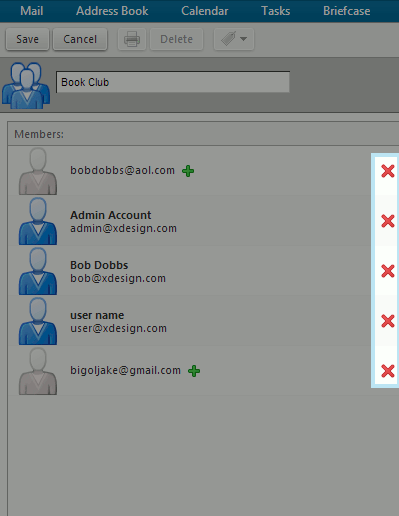 If you want to remove a member from your Contact Group simply click the red "X" alongside the contact's name. Remember to click Save along the application toolbar near the top to apply your changes! You can quickly search for a contact or contacts by typing in any text in the search field and clicking the Search icon . Be sure the pull-down menu beside the text field is set to Contacts. It is even possible to create multiple contact folders to help you manage your contacts. 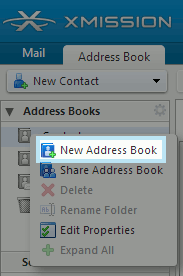 To create a new Contact Folder, ensure you have selected the Contacts tab and click the arrow beside New Contact to open a new menu. Then, simply click choose Contacts Folder. You will be prompted to name your new folder and select a location to store it. Once you click Okay, you will see your new contact folder listed under the Contacts heading on the left-hand column. Alternatively, to create a new contact folder you may right-click on the Contacts heading on the left-hand column and select New Contact Folder. 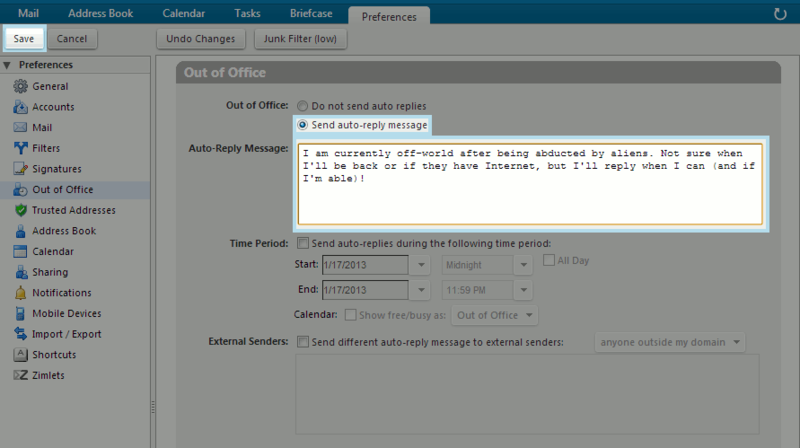 To set an "auto-reply" or "vacation" message, click on the Preferences tab and then select the Out of Office option. Then, be sure to enable your "away" message by ticking the option Send auto-reply message. In the box below that, type the message you would like sent when someone sends you an email. If you like, you can set the span of dates for the auto-reply message to be sent. If you don't set this, remember to disable your auto-reply message when you no longer wish it sent. You can also set a different message to be sent to "external senders." In this case, that would be anyone outside of your domain. Be sure to click Save near the upper-left corner of the window to save your changes. Note: The Zimbra auto responder feature only sends one response per address to prevent spam abuse. The following option is only available for Premium Zimbra accounts. If you would like this functionality, please contact our Sales department. 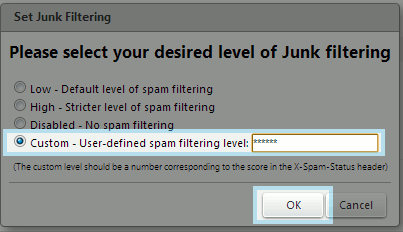 Enabling and disabling Junk Filtering with the Zimbra web interface is quick and simple. First, click on the Preferences tab and then select Junk Filter. XMission has three template rules for you to choose from. If you find you are getting too much SPAM, you may want to consider selecting the High option. Alternatively, if you don't want to risk losing legitimate messages you may want to choose the Low or even Disabled option. Be sure to click OK to apply your changes. Unfortunately, the more strict your SPAM filter, the more likely you are to risk losing legitimate messages. However, if you have a lower setting, your risk of losing legitimate messages is not as great but you may receive more SPAM. Please remember you may check your "Junk" folder at any time. This will help you refine your filtering decisions, and also ensure you don't miss any legitimate messages. 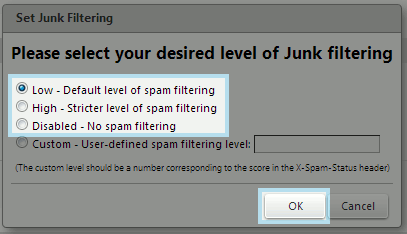 XMission additionally allows you to customize your Spam Assassin scoring system. You can do this using the Custom field. Spam Assassin is a robust system that presses every messages through a variety of filters to determine it's "SPAM score." Essentially, however many asterisks you place in the Custom field increases or decreases the likelihood of SPAM. For example, 8 asterisks in this field (the default Low setting) permits any message that scores 8 or less to be received. Alternatively, 5 asterisks (the High setting) only permits message that score 5 or less to be received. Increasing the number of asterisks will permit higher scoring messages to be received whereas decreasing the number of asterisks will consider more messages "Junk"'. Zimbra Base Business mailboxes use the following method to configure unwanted mail settings. Format in Plain Text is just that a Plain Text signature. 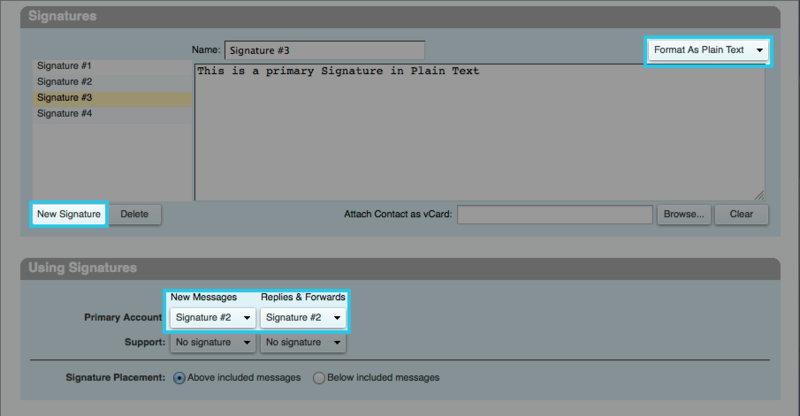 You can also choose Format in HTML and use Color and Images in your Signature. 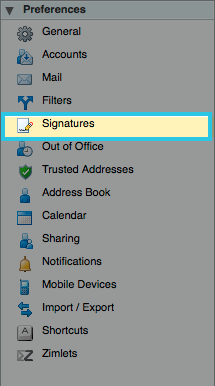 Using Signatures - Primary account - If you have multiple signatures you can select what signature you need for new emails or replies and forwards. Briefcase can be used to share and manage documents that you create in Briefcase or documents and images that you upload to your Briefcase folders. Use Briefcase to save files in your account so that you can access these files whenever you log in to your account from any computer. You can share your briefcases folders with others who can view and edit the files in the shared Briefcase. You can create multiple briefcase folders and then upload any type of file from your computer or your computer network, save attachments sent with your email messages, and create new documents. Files in Briefcase are copies of the original file, whether the file is on your computer or an attachment to your email. Changes you make to files in your briefcase do not change the original file. NOTE This feature is only available with a Zimbra Premium account. If you wish to use this feature and you do not have a Premium account, please contact our sales department. Click the gear icon and select New Briefcase. Enter a Name for the new briefcase folder. The briefcase folder name must be unique within the hierarchy of your all of mailbox folders. This name cannot match any top-level folder in your mailbox, calendar, or address book. For example, if you have a calendar named Holidays, you cannot name a top-level briefcase Holidays. Holidays could be a name of a briefcase within another briefcase. Select the Color of the new briefcase file. Select the folder hierarchy, either under Folders or under another briefcase folder. You can create a new top-level briefcase, or you can place it under an existing briefcase. Go to the Briefcase tab and select the Briefcase to save the file. Click Upload File and Browse to find the file to upload. In the Notes text field, add any information about the file. This information is displayed in the file list. To add another file, click Add. You cannot upload a file with the same name to the same briefcase. If a file is uploaded that already exists in the folder, an Upload Conflict dialog displays. You can either click Yes to upload the file, overwriting the existing file, or click No. The version number is updated if a file is overwritten. When all files are uploaded, click OK. Note: If you selected the wrong briefcase, you can use drag and drop to move the file to the correct Briefcase folder. If the file is too large, a warning displays. Files that you upload impact your account quota. 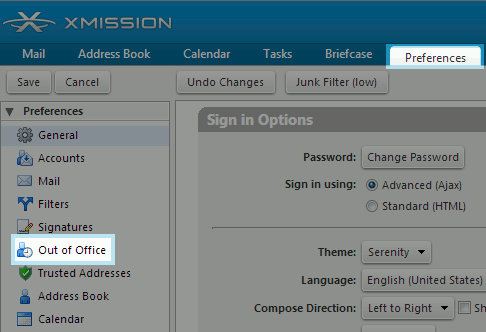 You can share your XMission Zimbra files with other non-XMission users by uploading them to your Zimbra Briefcase. 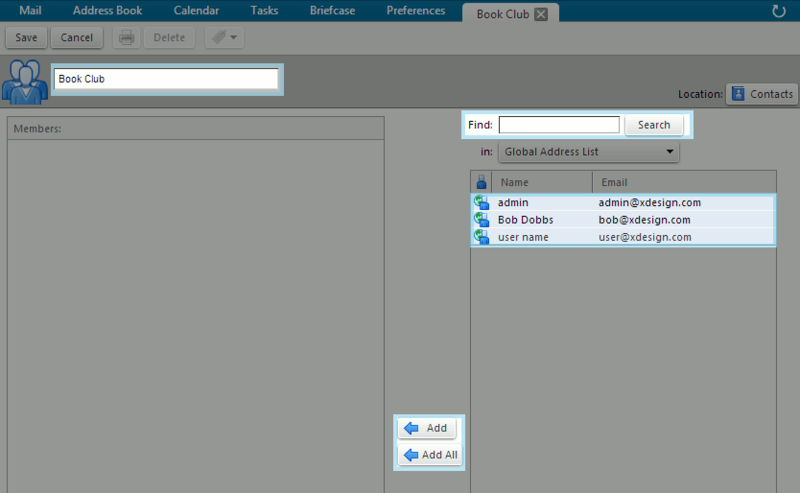 Select Briefcase tab inside your Zimbra webmail and create New Folder. 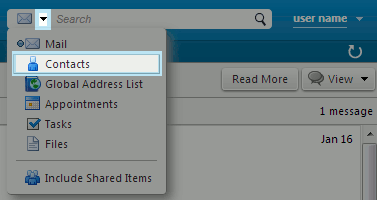 Grant an external user access to the Briefcase by right-clicking on the new folder and select Share Folder. Select External guests (view only) and enter their email address for the shared Briefcase. This page was last modified on 8 February 2019, at 12:21.